You are His treasure and He is making you His precious jewel. 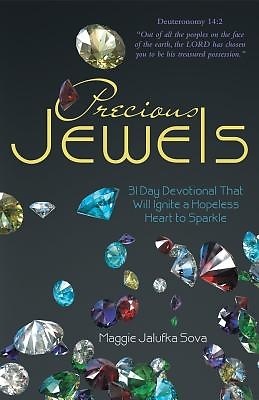 In this thirty-one-day devotional you will find precious gems of God's Word, which will transform hopelessness into hope. It is during hopeless situations in life that our faith is truly tested. As you meditate on the daily devotions, you will discover that your hope is the treasure in which faith stands. Put your hope in the almighty King. In Him all the treasures are stored up as you bask in His presence. Know that you are: - a daughter of royalty, - a precious jewel of beauty, and - a diamond to destiny. May you sparkle with a radiant fire that exudes and touches other diamonds in the rough. Be encouraged and know that you are unique, gifted, and created for purpose. The true diamond within will break forth in brilliance. "And they shall be Mine, says the LORD of hosts, in that day when I publicly recognize and openly declare them to be My jewels (My special possession, My peculiar treasure). And I will spare them, as a man spares his own son who serves him" (Mal. 3:17).